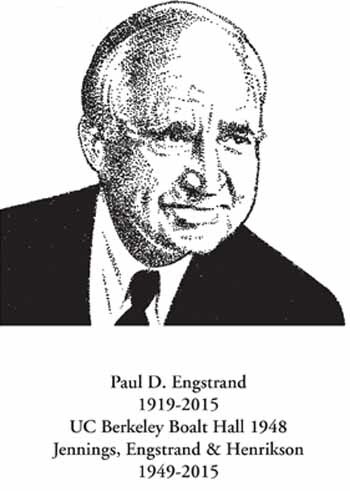 Paul Engstrand practiced law in San Diego for nearly 60 years. He was best known for his water rights litigation. Throughout his career, Paul tried numerous such cases including 34 that reached the appellate courts. The most significant of these was Escondido Mutual Water Co. V. La Jolla, Rincon, San Pasqual, Pauma, and Pala bands of Mission Indians, which Paul argued (and won) before the U.S. Supreme Court in 1984. Paul’s first case, however, involved a minor automobile accident. His opposing counsel, who had also just graduated law school, was John Butler who would later go on to be the Mayor of San Diego. During his career, Paul served as General Counsel to the San Diego County Water Authority and numerous local water districts as well as special counsel to cities and public entities. He was also active in the San Diego County Bar Association and other legal and civic organizations. During his time as president of the San Diego County Bar Foundation, Paul founded the Distinguished Lawyers Memorial. It is fitting that he is now being inducted into the Memorial. Born in Hutchinson, Kansas in 1919, Paul was the son of a minister. As a young boy, he was so unruly during church services that his father would sit Paul at his feet in the pulpit. Paul would tug at his pants when he thought he had preached long enough. Paul credited his father for teaching him honesty, sincerity and to work hard at whatever he tried to do. Paul attended Bethany College in Lindsborg, Kansas, where he was referred to as “the brains of the freshmen class.” One of his many extra-curricular activities was singing bass with the Messiah Chorus and the A Capella Choir. For most of the remainder of his life, Paul returned to Kansas each Easter to attend the Messiah Festival at Bethany College. After teaching high school and coaching a girls’ debate club for one year, Paul was granted a scholarship to attend Baylor University Law School in the fall of 1941. After the attack on Pearl Harbor, Paul joined the Army Air Corps and served as a pilot during WWII. After the war and a move to California, Paul enrolled in UC Berkley Boalt Hall in 1946. It was there that he met Leo R.B. “Rik” Henrikson. After graduation, the two moved to San Diego to establish a practice. In 1949, Rik and Paul became partners with William H. Jennings and the firm of Jennings, Engstrand & Henrikson (JEH) was born. JEH was a leading local law firm for 44 years, first located in La Mesa, then Mission Valley and finally downtown San Diego. For many of those years, Paul served as managing partner. He retired from JEH in 1991 but continued to practice as Of Counsel to Horton, Knox, Carter & Foote until 2007. After retiring from the law, Paul stayed active playing golf and rooting on his beloved Padres and Chargers. Paul is survived by his wife of 45 years, Iris, who he met while trying a water law case in which she served as an expert witness. Paul leaves two sons, David and Craig, and one daughter, Kristin, as well as six grandchildren and seven great grandchildren.